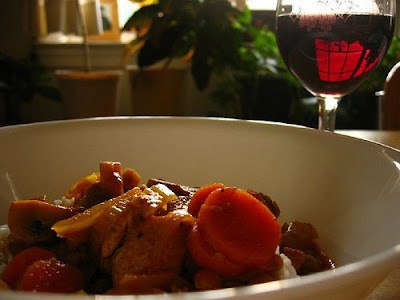 Casual Kitchen: Why You Should NEVER Use "Cooking Wine"
Why You Should NEVER Use "Cooking Wine"
Where I currently live you can't buy wine in grocery stores. But (proof that the gods often torture us) you CAN buy a liquid called "cooking wine." Probably the best known brand is made by Holland House. I read somewhere once that the reason it's okay to sell cooking wine in grocery stores is because there is a lot of salt added to the "wine" to make it "unpalatable" and thus not suitable for drinking like regular wine. Have you ever tasted this stuff? "Unpalatable" is too diplomatic a term. So my rule for you is this: Don't ever buy cooking wine. Don't ever use cooking wine. The salt content is too high. It tastes like salt and it will make your food taste like salt. Worse still, it is way overpriced per unit of volume. Instead, take your culinary skills up a notch and use a low-priced table wine that you can buy by the gallon. The favorite in our household is Carlo Rossi, and we prefer either the cabernet, chianti or the burgundy. We keep a jug'o'wine in our kitchen handy for cooking or anytime I feel like I need to rinse some cholesterol out of my cardiovascular system. For $10-12 you can buy an entire gallon of Carlo Rossi at your local liquor store and get decent quality wine. Plus you can knock back a glass while you're cooking and enjoy life a little bit more. On the other hand, for $3.49 you can get 12 lousy ounces of Holland House Super Sodium Special Unpalatable Wine. Do the math. 1) Season the chicken with cayenne pepper and coarse ground black pepper. Sear the chicken in olive oil in a non-stick on high heat, turning and flipping the chicken occasionally. Set chicken aside. 2) In a large soup pot, heat a few tablespoons of olive oil and then add onions, carrots, mushrooms, celery and spices. Saute for 15-20 minutes on medium heat, stirring often, until vegetables begin to soften somewhat. 3) Then, add the chick peas, tomato sauce, water and red wine. Bring to a boil and simmer for 25 minutes, stirring occasionally to prevent sticking. Add the chicken and serve over rice or couscous. Mmmmmm, this sounds delicious! Could this be made vegetarian-style, or would it need a protein boost from tofu to round it out? This recipe is the real deal, absolutely delicious and a snap to make. Don't skimp on the cayenne! Hi Taylor, thanks for your comment! MP, you can theoretically make this dish using very firm tofu, I bet it would come out great that way. Thanks for your question and for reading! I would love to use regular wine instead of cooking wine in my recipes, but I have one concern. Doesn't it go bad? I don't drink, so I have no firsthand experience, but I thought wine has a limited shelf life once opened? White wines will begin to oxidize (once opened) after a few days. They won't "go bad" per se, but they will won't taste quite as good for drinking. But for cooking purposes, you can keep an opened bottle of white wine tightly stoppered in your fridge for a couple of weeks, if not longer and still use it in recipes without a problem. For red wines, the same concept applies, but red wines will keep even longer. Thanks for the quick response! I'll definitely pick up some inexpensive (real) wine in the near future to experiment with. Also, wine freezes. No kidding. Even Cook's Illustrated gave it their blessing. You can freeze it plain or take a bottle of red and simmer it with bay leaves, garlic clove, peppercorns and such until you have a lovely and handy concentrate that will fit nicely in ice cube trays. That helps if you tend to buy a bottle "to cook with" and end up drinking it and blowing a budget line item. That's a great idea Rachel! Even if the wine degrades somewhat in the freezer it will be perfectly well suited for use in a recipe. I usually buy the single serving bottles of gallo ... and open a fresh bottle every time I need wine in cooking (and don't have any leftovers). Careful about the recipe, never use high heat with a non-stick Teflon pan. While I understand the comment about cooking wines, that is actually bad advice. Some (like me) find that when an open bottle of wine is in the house, it has a disappearing act that always means you are out of a key ingredient for a recipe when you need it. The key to good cooking wines is to be selective and purchase the better wines in this catagory just like anything else. If you buy a cooking wine from Holland House, you are essentially buying a cheap house brand. Would you buy that way for your drinking wine? No. The key to cooking with this kind of wine is to understand how much salt is in the wine. Once you understand that, you can balance the salt in your other ingredients and keep the dish tasting right. The benefits of this kind of wine? 2. Taste is always consistant, no vinegary taste. Interesting points WCM, thank you for sharing. I still am having trouble understanding why I'd add a heavily salted wine to my food, however. Furthermore, a 16-ounce bottle of Holland House wine, which can cost $4.29 in our grocery store, is far more expensive than the gallon monster jug of Carlo Rossi table wine that we can buy for $12. To me, the numbers and the sodium just don't add up. Well thanks for the information on the red wine, namely Holland House. I just bought some for the first time so I guess I will use it just for pretty bottle in my kitchen! Daniel, your recipes could use many tweaks. i find your recipes bland. No salt listed for this recipe, but we added some, and it improved the flavor a lot! Tasty!